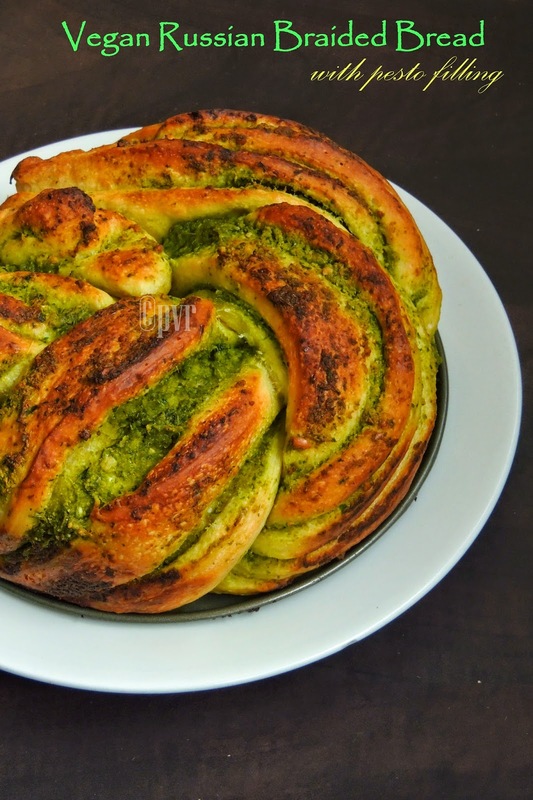 This Russian braided bread, i picked from here, can be prepared even with cinnamon sugar filling, however i opted for a savoury version with a simple pesto. 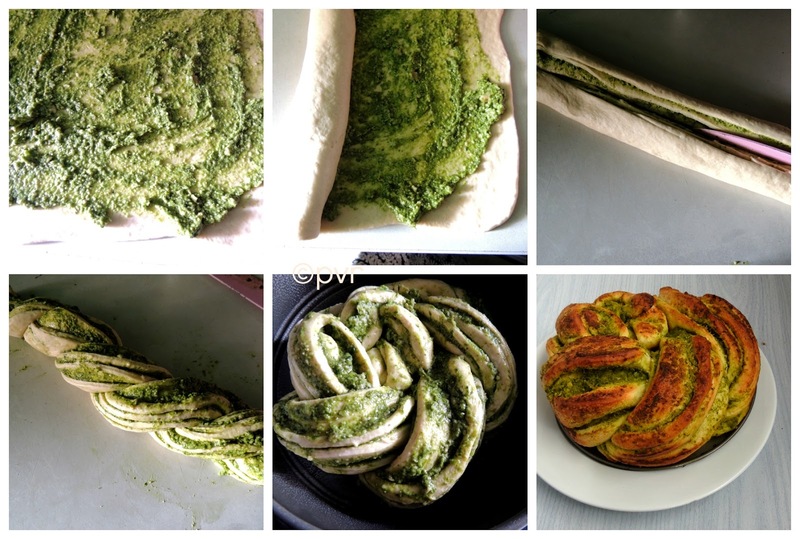 If you love pesto in your bread, trust me this bread will definitely satisfy your tastebuds. Since pestos gets ready in jiffy,you can make this bread easily at home. 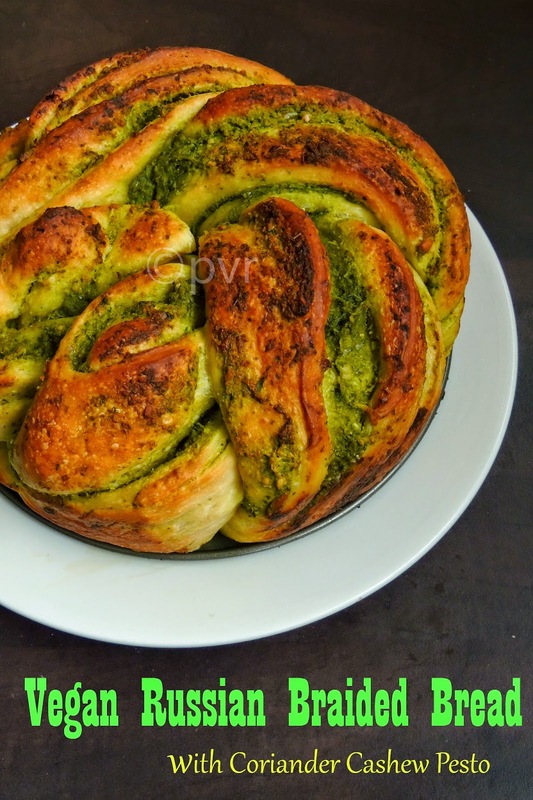 Also if you dont know how to shape, you can still make an easy breezy pesto rolls with this bread dough and with a homemade pesto.The choice is yours, however personally this braided bread is very easy to shape thats why i shared the stepwise pictures, check it and bake your own braided bread at home. In the bowl, take the flour, yeast, sugar, and salt. Heat water and canola oil until luke warm, add to flour mixture and add vinegar knead until well combined. Knead the dough for 10 minutes. Place in a greased bowl, grease the top. Cover, let rise in warm place until almost double. Grease springform pan, and line bottom with parchment paper or grease well. Set aside. Punch down the dough. On a floured surface, roll the dough into very thin rectangle, as thin as you can. Spread a thin layer of pesto on top of the dough. Start at the long edge and slowly, tightly and gently roll the dough into a log. Use a bench scraper or a knife to cut the dough in half lengthwise. Cross the two halves (layers facing up) to create an X shape. Braid top and bottom of dough by laying the left piece over the right keeping the cut side up, until pieces of dough are tightly twisted. Pinch ends together. Start at the thinner edge and slowly and very gently, roll the braid into large bun. Be careful to keep all the layers facing up. Pinch the end delicately. Bake at 400º for 5-10 minutes, lower oven temperature to 350º and bake for an additional 20-30 minutes. When the bread is out of the oven lightly brush olive oil on top and sides. Let cool on a rack. Wow, such a pretty looking bread. Surely tastes awesome. You have such wonderful bread collection. Savory breads are my favorite Priya, the filling for this bread sounds awesome, looks perfect and delicious! This just looks divine.............what a beauty of a bake!! What a beauty! Wish I could have some! The braid is perfect. I love the vibrant color of the pesto. Priya, u r just awesome.Perfectly Baked ! Wow lovely and flavorful bread.. Looks too delish..
wonderful bake looks so yum! Wonderful cake..looks so cute and delcious. I baked a similar one with cinnamon sugar. Love yours with pesto even more! Good work, Priya. would like to call u as a expert in bread baking..hehehhehe..no words dear..